There's good news this week for Europe's top business schools: Applications to European MBA programs are growing faster than those in the States. The findings highlight the growing preference for one-year MBA programs, compared with the two-year model preferred by Ivy League US schools. European MBA programs across the board — including online degrees — appear to be experiencing stronger application growth, whereas full-time two-year MBA programs worldwide are indicating declines this year. That's according to the 17th annual Application Trends Survey from the GMAC, which runs the GMAT entrance test. The survey findings are based on a record number of responses from 335 business schools and faculties worldwide representing 872 graduate management programs. The data confirm the growing allure of Europe's top schools, which have long languished behind US peers in key MBA rankings. 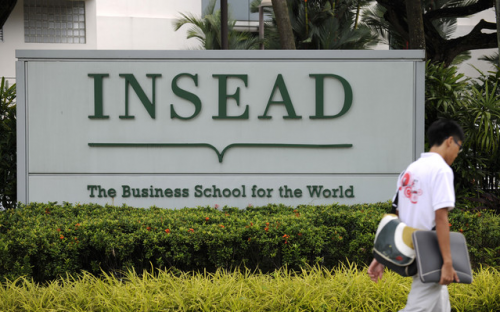 Last year, the 12-month MBA at INSEAD in France became the world's top ranked by the Financial Times — the first EU school to pull off the feat. “With the competitive landscape changing, applicants have more options from which to choose, creating a mixed picture for business schools today,” said Sangeet Chowfla, president and CEO of GMAC. It's a sharp reversal of fortunes for US schools, which reported in 2014 that the demand for the two-year MBA was back with a bang. Sixty-five percent of European programs grew their application volumes — 20% more growth than programs in the US and Asia. What's more, 74% of full-time one-year programs in Europe reported year-on-year increases, whereas only 43% of schools in the US market did. One big trend driving the shift is the growing focus on return on investment. Because programs in Europe are shorter, and therefore cheaper, than those in the US, graduates can recoup their cost of tuition in a breezier fashion. In a recent ranking of MBAs on return on investment by salary benchmarking site Emolument, 13 European schools featured, compared with 8 US schools. “Value for money is a big concern,” says Michelle Sisto, director of the MBA at EDHEC Business School in France. This might explain the continued surge in demand for online MBA programs. Fifty-seven percent of them reported application spurts, up from the 50% that did so in 2015. Also, about 10% of online programs are new in 2017, signalling schools are implementing programs that are in high demand. “Business education is transitioning to a hybrid business model,” says Ivan Bofarull, director of the Global Intelligence Office at ESADE Business School, coining the phrase used to describe courses that blend bricks and clicks. The allure of online degrees is that candidates do not have to take time out of the workforce — incurring a big wage and also opportunity cost. Meanwhile, for the first time since 2008, a majority (51%) of executive MBA programs reported growing volumes, 8% higher than last year. This signals that the corporate training market is showing signs of resurgence, after companies slashed training budgets during the financial crisis and the percentage of employers willing to pay for MBA degrees plummeted. Also worthy of special mention is the rise in demand for masters in data analytics degrees, as companies embrace the big data revolution and demand managers who can implement data-driven decision making. More than 90% of the 16 data analytics programs surveyed by GMAC said applications grew in 2016.